View "Tools of the trade"
For over 70 years, Resene has forged a reputation of excellence and quality in manufacturing products designed to meet the demanding standards of architects, engineers and property owners and managers. The Resene range includes paint and specialist coating products for residential and commercial buildings. Resene is renowned for its environmental friendliness. To reinforce this position we joined the Environmental Choice Programme in 1996. Resene’s commitment to this programme and our continuous development process to reduce the risk our products may present to our customers will ensure that safer, professional quality paint is available to everyone. Resene has pioneered product stewardship introducing Resene PaintWise, facilitating the recovery of unwanted paint and paint packaging. Resene has diverted over 3 million paint packs away from landfills and recycled paint into uses such as covering graffiti. Other waterborne paint is used for the PaintCrete application where waste paint is used as an additive in concrete manufacturing. Today, after over 70 years in business, Resene remains 100% New Zealand owned and operated. Resene is recognised as an innovator in colour and a manufacturer of quality paints. Resene combines extensive industry experience and expertise to support the delivery to property owners, managers and specifiers outstanding, cost-effective finishes and protection on their decorating projects. Inspection and documented observations on the building or structure to be painted. Development of a sustainable coating specification with a strong focus on Environmental Choice approved systems and low VOC requirements if desired. Technical advice on products, systems and specific application techniques. Practical on-site product trials and ongoing technical assistance where required. Site inspection sheets held on file for future access. Tendering of contracts (where appropriate). Colour consultancy service, encompassing Resene RenderRite colour visualisation, custom colour creation, colour matching and the development of colour schemes. The complete Resene project development service covers all facets of the coatings process. We can draw on a range of staff from technical experts through to colour consultants to provide whatever assistance you require. While some projects require the full-service approach where the Resene representative is involved in all steps (see flowchart below), it is also common for building owners and managers to manage the project more closely and run their own tenders. In these situations, owners, managers and specifiers are welcome to seek our advice on suitable coatings and application to assist with their new build or refurbishment programmes. The level of our involvement in any specific project is up to you. If preferred, we will work alongside your chosen agent. For those specifying Resene products on commercial or large scale residential work, our services are free, therefore you can use us as much or as little as you like. Full support available at all stages of the project. Applied finishes, including waterproofing membranes and a range of textured coatings. Innovative colour scheme development and tools – the Resene Total Colour System. Sustainable product range and our commitment to bringing new sustainable technologies to market. Proven track record in project services. Quality products backed by ISO 9001 and ISO 14001 accreditation. We are leaders in providing professional advice, high quality products and superb colours – the three vital ingredients in any successful coating project. Whether your requirements are large or small, you’ll find that Resene has the service and products that are designed to suit the local environmental conditions and you. Please contact your Resene representative or your Resene ColorShop for further information. Resene staff will visit the project while it is being coated to provide technical advice and assist with problem resolution. All observations made during these visits will be recorded on Site Inspection Forms. Copies may be obtained by the client on request. The number of site visits will vary depending on the warranty requested. Site inspections are not intended as a replacement for the applicator’s own quality assurance systems. These systems need to be managed by the applicator and principal contractor and Resene recommends workmanship guarantees be negotiated between these two parties at the time of tender negotiation/submission. Resene is available to provide guidance through to assessments as required. Visit all proposed repainting projects or review drawings with you and determine the scope of the project and discuss options and recommendations to suit the client’s brief. Detail preparation and painting systems by substrate. If required, be used as a contract document. In consultation with you, we can provide a number of warranty options for your consideration. We will provide a colour consultancy service resulting in a colour scheme recommendation being presented for your approval. Resene offers a wide range of colour services from colour tools, such as colour charts and drawdowns, through to complete colour scheme development and Resene RenderRite electronic colour renders by specialised staff. Upon acceptance of the specification and colour scheme, we will provide suitable painting contractor recommendations if required. Resene are able to help manage the tender process and organise quotes at the request of the building owner or manager. These quotes will be sent directly to the Property Manager. We have strong working relationships with paint contractors and the construction industry and have intimate knowledge of their businesses and working methods. This knowledge is invaluable in the tendering process. Resene staff will visit the project while it is being coated to offer technical advice and assistance. All observations made during these visits will be recorded on Site Inspection Forms. Copies may be obtained by the client on request. The number of site visits will vary depending on the warranty requested. Site Inspections are not intended as a replacement for the applicator’s own quality assurance systems. These systems need to be managed by the applicator and principal contractor and any workmanship guarantees negotiated directly between these two parties. Upon completion of the project Resene will inspect the property and provide written acceptance of any warranty obligations established at the time of specification writing. A record of Resene colours and coatings systems used for the project should be retained on file by the Property Manager. Visit all proposed repainting projects with you on site, or for new build, meet in your office, to determine the scope of the project. If appropriate, provide alternative coating systems, allowing a higher performance system or more sustainable system, to be chosen. For example, coating a concrete wall using an anti-graffiti system in place of a high gloss acrylic. Alternative coating solutions may be tailored to your budget and maintenance expectations. Where both practical and available specify low Volatile Organic Compound (VOC) and Environmental Choice approved products. 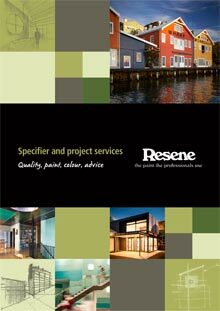 For those who prefer to write their own specifications, Resene has the One-Line Specification system and the online TechSpec service that provides clear, simple guidelines for specifying Resene products, backed up by Resene representatives who can assist with specification advice and preparation. Our customised specification service, free to those specifying and using Resene for their projects, is perfect for large projects or tricky specifications. Resene offers a wide range of colour services from colour tools, such as Resene RenderRite colour visualisation, colour charts and drawdowns, through to complete colour scheme development by specialised staff. Enjoy the Resene Promise of Quality on your Resene coating system. Our products are guaranteed to provide film integrity and adhesion for the expected life of the paint system. 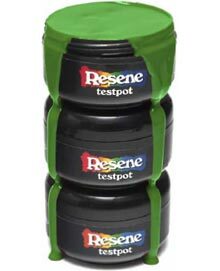 Resene products are technologically advanced and made from high quality raw materials under laboratory guidance. Written guarantees may be custom-designed for specific projects using Resene paint systems. Guarantees that apply to a particular system can be confirmed at the time the project specification is written and must be requested and agreed in writing when the project is specified. Upon acceptance of the Specification and colour scheme, we will provide suitable painting contractor recommendations if required. Resene are able to help manage the tender process and obtain quotes and estimates on behalf of, and at the request of, the building owner or manager. Upon completion of the project Resene will inspect the property and provide written acceptance of any product warranty obligations. Sustainability and being green is something we’ve grown up with at Resene, long before it was the topical issue it is today. In the 1950s we introduced waterborne paint to the local market and created a whole range of waterborne paint innovations. We were the first New Zealand paint company to offer an extensive range of Environmental Choice approved paints in 1996, reaffirming our early commitment to the environment. 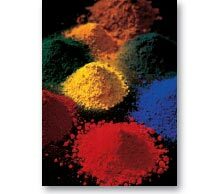 Resene Environmental Choice paints make it easy for our customers to make sustainable purchases. This is because they are from the existing range of Resene paints, so you don’t have to pay more to get an environmentally preferable product. High quality, durable performance, superb colours and Environmental Choice approval comes in the same can. When it comes to hard facts on solvent reduction, our results speak for themselves. The average per litre VOC (volatile solvent) levels of Resene decorative paint sales have dropped by over 90% since 1980. Our unique Resene Decorative tinters with no added VOCs enable our customers to choose from thousands of colours, which can be tinted into their choice of decorative paint without adding any VOCs. While our Resene Environmental Choice paint colours are ‘green’, the technology is ‘cool.’ The unique formulation and materials of the Resene CoolColour™ range allows them to absorb visible light so they look like a normal colour but reflect more of the sun’s energy keeping the surface cooler, reducing stress on the coating, substrate and building. Resene also educates its customers on sustainable product choices and systems. 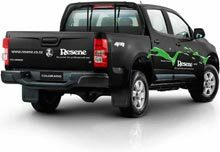 The Resene Eco.Decorator programme has been designed to recognise a nationwide network of environmentally responsible, quality focused painting contractors, providing confidence to the end customer that both the paint and the application method meet quality and sustainable standards. And to complete the sustainability cycle, we offer Resene WashWise wash systems to minimise waste water from cleaning up after painting and run a world first innovative paint recovery and recycling programme called Resene PaintWise. Those with old paint or paint packaging (of any brand) can return them to the Resene PaintWise service for responsible recycling. Over 3 million paint packs have already been returned with paint donations going to community group projects all over the country and to cover unwanted graffiti. Since the very early days of our company’s development we’ve had the ‘green gene.’ It’s simply part of our heritage of providing quality sustainable solutions for our customers and the environment. Resene’s focus on sustainability has been recognised with many awards, including being named Sustainable Business of the Year in 2010. Sophisticated tinting technology enables Resene to produce durable colour options that remain true to colour. We utilise a variety of colour scheme aids to simplify colour selection. Our computerised colour rendering service, Resene RenderRite, is one example where you can ‘see’ the finish before the painting has even started. To help building professionals keep abreast of new developments in our product range we have an innovative range of project services and reference materials, including technical and specification manuals, the Resene Total Colour System, samples and online information. Resene not only provides a complete coating project service, but also the quality products and colours you need to get a superb finish. The Resene product range includes paints, stains, oils, clears and specialist coatings for residential and commercial buildings. The key to Resene’s reputation is its solid commitment to excellence and quality, monitored through controlled testings in the Resene registered laboratory and in the field. All products are backed by a technical team committed to maintaining product quality and constantly researching new or improved technologies to enhance product performance, application and safety. Resene paint is recognised as world class, evidenced by our exports of paint technology. Our internationally recognised quality systems and ISO 9001 and ISO 14001 accreditation allow us to guarantee our products for consistency and performance, so Resene quality is assured – every step of the way. Australasia’s harsh marine environment and high levels of damaging ultraviolet rays quickly expose the limitations of overseas colour systems. As a result of this early discovery, Resene developed the truly innovative Resene Total Colour System, based on sophisticated technology, to provide the necessary protection against the elements. Sophisticated tinting technology enables Resene to produce durable colour options that remain true to colour long after they have been applied, including the integral tinting of a wide range of textured and specialist coatings. The Resene Total Colour System provides for innovative tinting options in an interlinked full range of decorative and protective coatings allowing for the same spectrum of colours to be achieved in a wide variety of products. The interlinked colour system was the first of its kind in the world. When it comes to colour, paint is about fashion. Colours come and go with changing trends. Flexibility in colours, colour tools and colour scheme development is paramount. 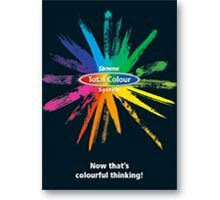 The Resene Total Colour System offers this flexibility through a wide range of colour services, from colour tools such as colour charts through to special colour matches and complete colour scheme development by specialised staff. We utilise a variety of colour scheme aids to simplify colour selection. Resene has embraced electronic imaging technology to convey colour and simplify the development and confirmation of colour schemes. Our customers can design colour schemes and order samples and paint wherever they are. Our computerised colour rendering service, Resene RenderRite, is one example where you can ‘see’ the finish before the painting has even started. Exclusive Resene Decorative tinters enable tinting of a full spectrum of Resene colours without adding unwanted VOCs. Most Resene colour tools are finished in Environmental Choice approved Resene paint finishes to give a truer representation of the actual colour. Find out more about Resene colour options in our ‘Now that’s colourful thinking!’ brochure or view online. With our vast knowledge of coatings, we can tailor a coating solution and colours to suit your project requirements. 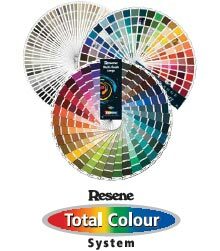 We have a huge range of customers enjoying the benefits of their customised Resene coating and colour solution.